And my next party feature goes to this spooky HAUNTED MANSION HALLOWEEN PARTY submitted by Danielle Arcese of Cutie Putti Paperie. 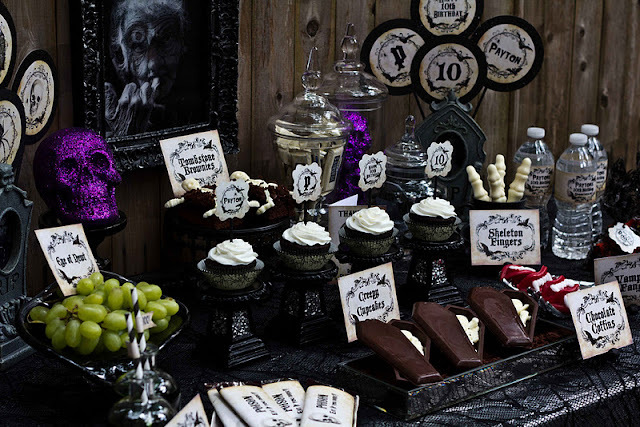 Danielle threw this party for a 10th birthday- Halloween style! I bet all the guests had a blast! 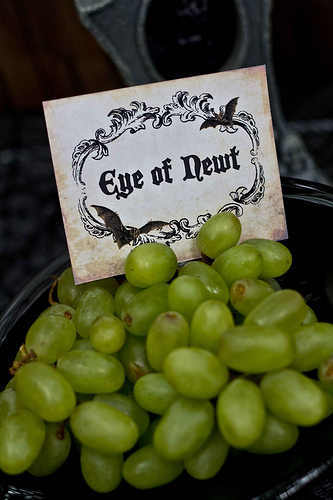 I just love all the food with the appropriate halloween themed labels. 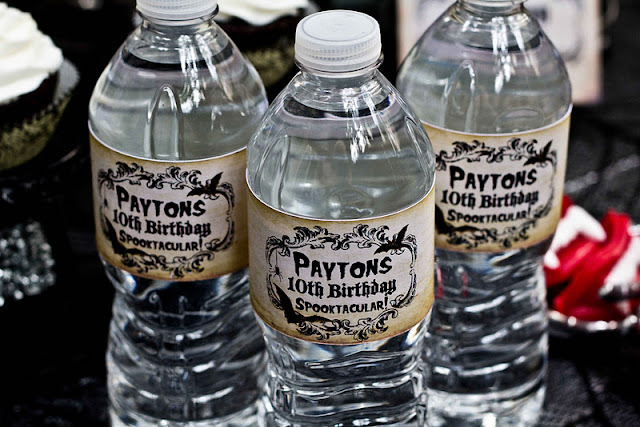 So much detail went into this celebration! Danielle is offering 15% off ANYTHING in her shop to all my followers this month! Hurry and take advantage of the discount because October is almost over! Use coupon code KARA15 at checkout! 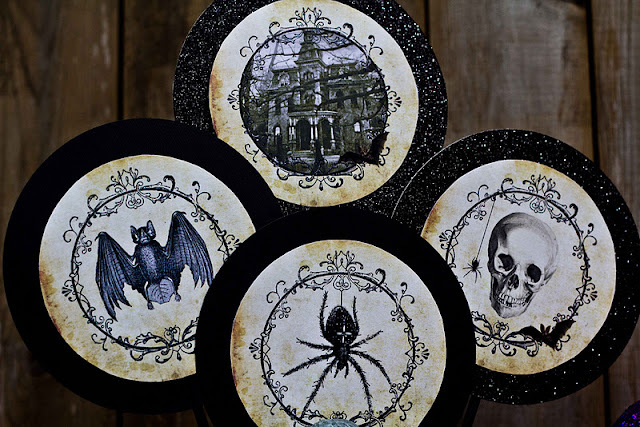 Here is what Danielle said about the party- "I created a spooktackular Haunted Mansion printable party collection this year for Halloween, that is now available in my Etsy shop. 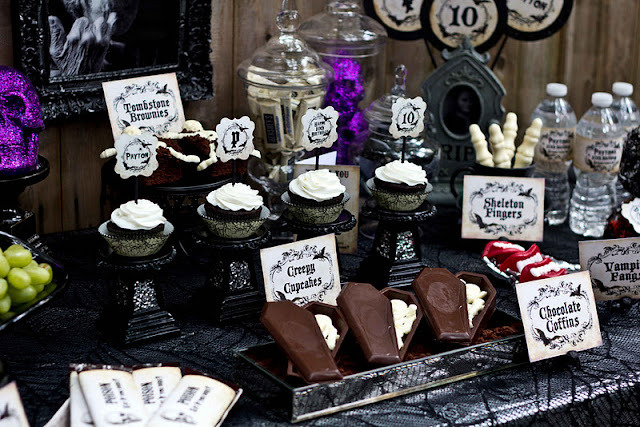 I had a friend when I was growing up who had her birthday around Halloween, and she always had a halloween themed party. She hated it, but I thought it was amazing! 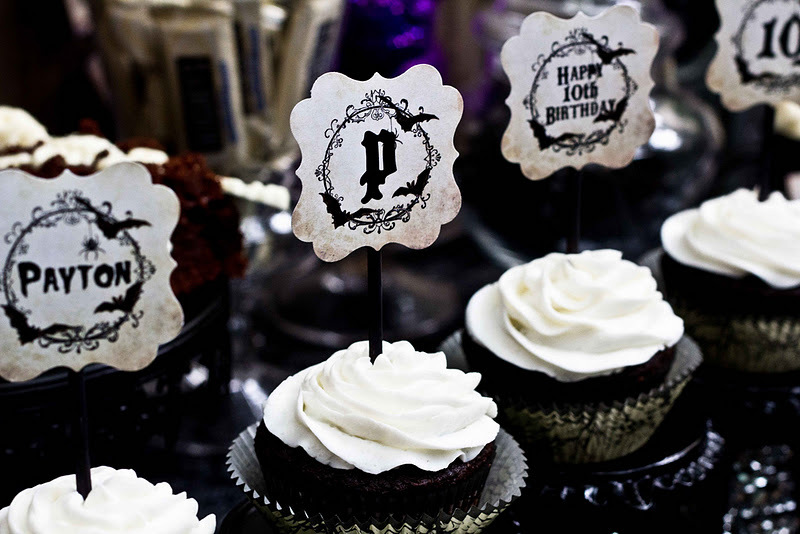 What could be better them a costume party birthday, and even more fun to set the scene by transforming your home into the infamous Haunted Mansion! I used gothic style text on an antiqued paper background for all of the paper goods. Spooky bats, skulls, and spiders adorn the items as well. For the table I was able to find great items in my local Home Goods and Michael's craft stores to set the mood. 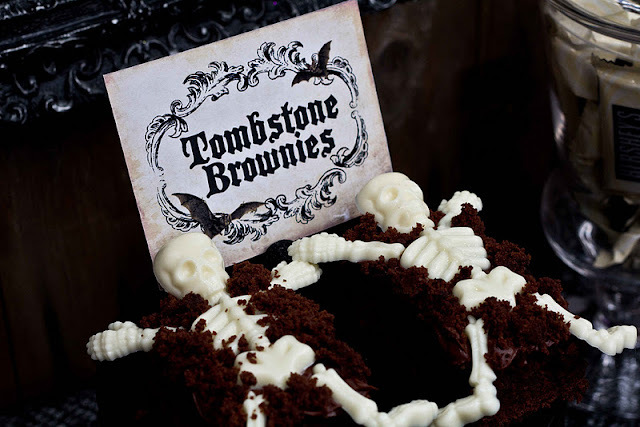 Tombstone Brownies- I found a super cute skeleton parts chocolate mold at Michaels. Bake and cut brownies into squares, chocolate frosted the tops and added brownie crumble to look like dirt. Lastly I bought white chocolate melts to make the skeletons and added them to the top. Again I found a chocolate coffin mold at Michaels, and used dark chocolate melts to make them. 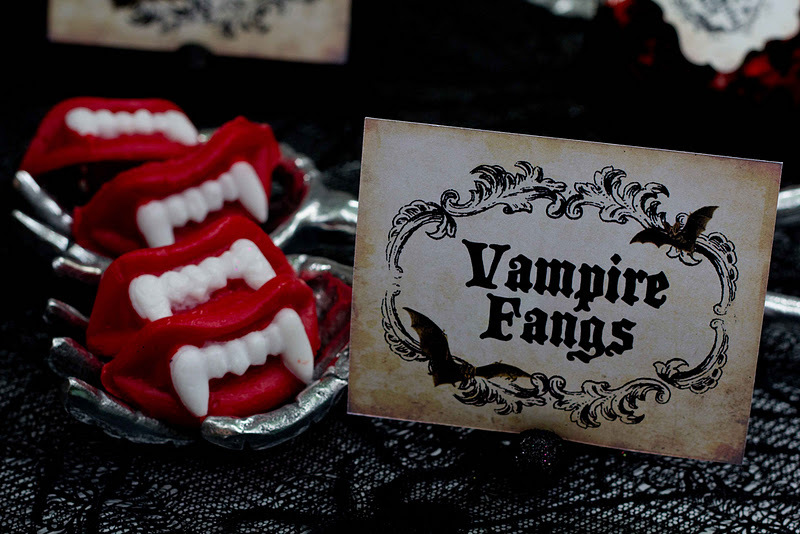 The molds are super easy to use. Melt the chocolate in a double boiler and pour into mold. After 15min in the fridge they are ready, and they pop out of the mold easily. 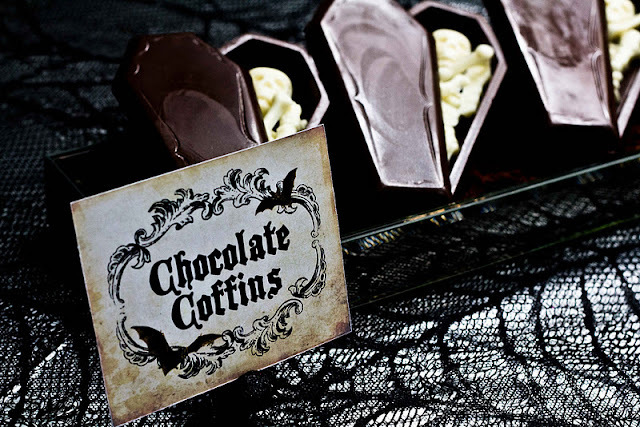 I added a collection of white chocolate skeleton bones to each one, and lined them up in a rectangular vintage mirrored glass dish lined with crumbled brownies to look like dirt. 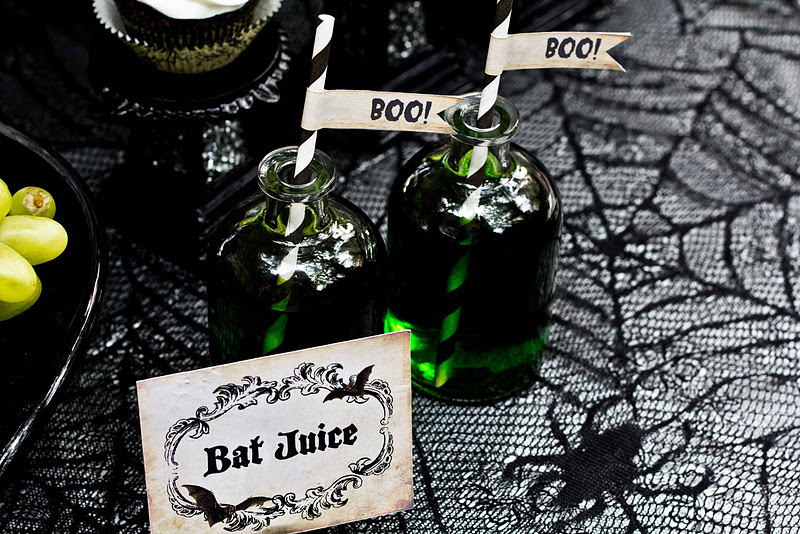 Bat Juice- Green Powerade with a little added green food coloring to darken the juice. 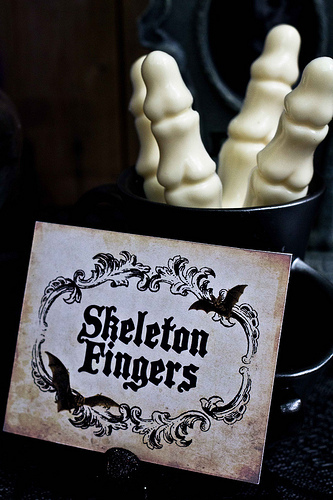 Skeleton Fingers- This mold was also found at Michaels. The mold is specifically made for pretzel rods. Fill mold with white chocolate and insert pretzel rods before cooling in the fridge. 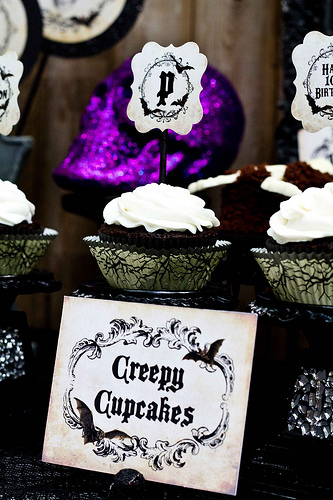 The cracked mirror pedestals I used for the cupcakes were candle holders found at Michaels. I snagged a super cool scary hologram portrait at Home Goods. At one angle its a creepy old man face, and from another it transforms to a skeleton. 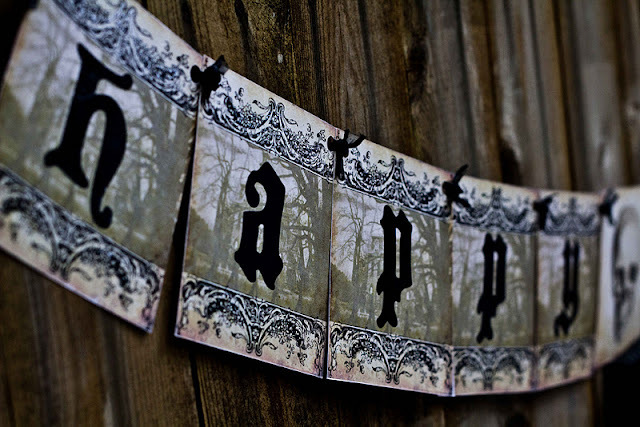 Great for setting the mood, looks like it came right off the walls of a true haunted mansion. 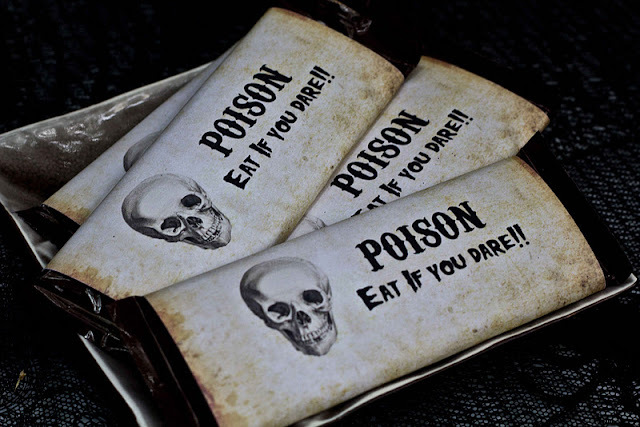 For the final touches I created POISON chocolate bar wrappers, for goulish girls and boys to take home with them. The back reads "You survived the Haunted Mansion" with a warning that reads "May contain bat parts". 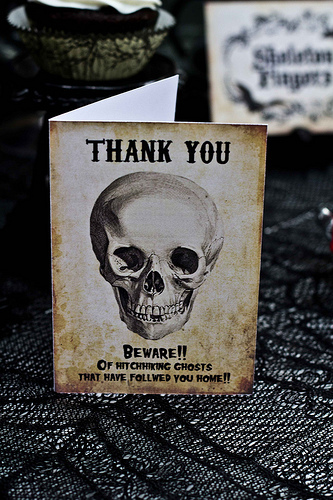 The thank you cards read "Thank you! Beware of hitchhiking ghosts that may have followed you home!!" 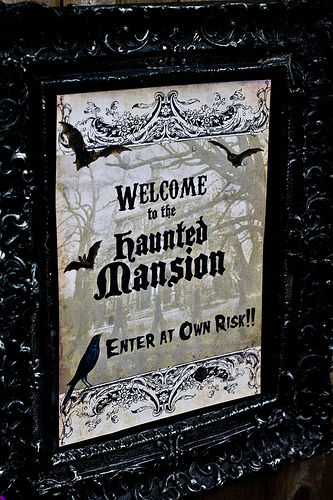 One of my favorite tag lines from the original Haunted Mansion ride at Disney. The whole collection is available in my Etsy shop here!" WOW what a party!!! 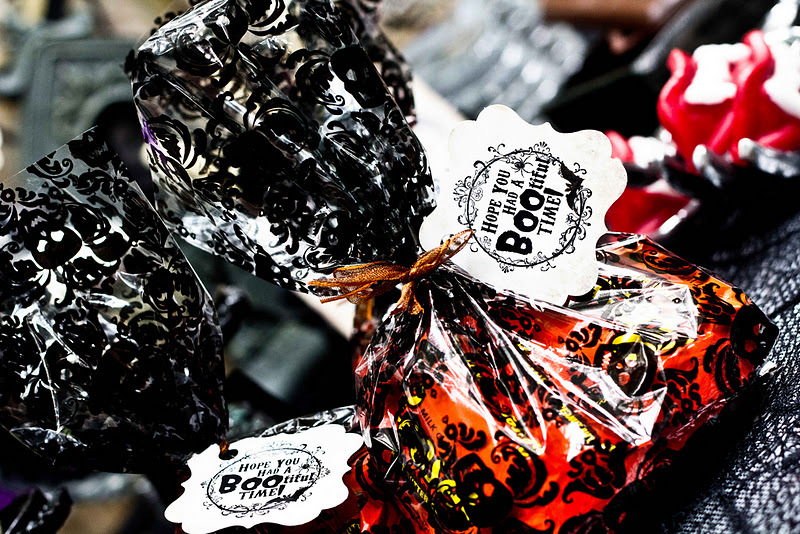 That gets me excited for Halloween!!!!!!!!!!!! I like this party, there are so many details. I like the prints, esp. the old lady in the background and the tree theme. But there is a spelling mistake in the thank you notes! It says "follwed" instead of "followed".